Around this time Leonardo paints the Portrait of Cecilia Gallerani (The Lady with the Ermine), when Cecilia was Ludovico Sforza’s mistress. 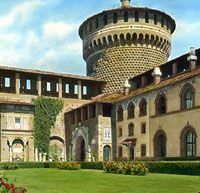 On 13th January Leonardo produces the stage set for Bernardo Bellincioni’s La Festa del Paradiso (“Feast of Paradise”) performed in the Castello Sforzesco, Milan, to celebrate the wedding of Gian Galeazzo Sforza and Isabella of Aragon. On 21st June Leonardo accompanies Francesco di Giorgio to Pavia in connection with the project to rebuild Milan cathedral. They are both paid for their expertise. Leonardo begins Paris Manuscript C and the Codex on the Flight of Birds. Leonardo recommences work on the equestrian monument for Ludovico Sforza as a monument to his father Francesco.